Award winner Michiel Borstlap is one of today's most celebrated musicians, regularly performing on renowned stages across the globe. Over the past decade, the Dutch pianist and composer has gained international acclaim for his original music and his highly communicative interpretations of a broad musical scope between pop, jazz, dance and classical music. 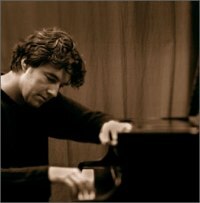 Borstlap won the prestigious Thelonious Monk Award 1996, which brought him his first major international audience. Applauded at festivals in New York, Sydney, Beijing, Tokyo, Vienna, Berlin, Umbria, Chicago, Cape Town, London etc. for his musical skills and flamboyant virtuosity of the piano, Borstlap also is renowned for his compositions which has been performed and recorded by artists such as Herbie Hancock, Pat Metheny, Wayne Shorter and Bill Bruford.